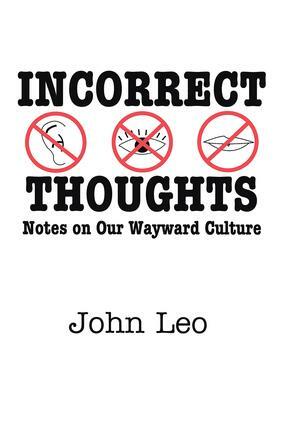 In this new volume of political essays and social commentary John Leo offers a lively alternative to the Washington-oriented slant of much political journalism. Rejecting the dry insider's air of knowing punditry, Leo's conversational style and acerbic wit engage the reader with his insightful and humorous views of what is going on in education, law, advertising, television, the news media, language, and the various liberation movements that are shaping-and sometimes convulsing-the country.The unifying thread of Incorrect Thoughts is the emergence of Political Correctness and its diffusion throughout American social and cultural life. Most of the media have viewed the rise of PC as a collection of unimportant oddball anecdotes, but Leo perceives it as a coherent social movement sweeping through colleges and schools, the courts, the media, the feminist movement, and the art world. Its goals are traditional goals of the left-equality, inclusion, liberation, racial justice-but, as Leo notes, the tactics employed are often less than noble and the contempt for tradition, standards, and Western culture has grown each year.The new orthodoxy has developed a taste for censorship and coercion. Speech codes and anti-harassment policies are used as weapons to silence and intimidate opponents. Speakers have been shouted down and whole editions of college newspapers stolen to keep students from reading the arguments of conservatives and moderates. Readers will find here judicious and often devastating appraisals of self-esteem and therapeutic trends in education, of efforts to revamp history along multicultural lines, and of the extremities and absurdities of identity politics among other of the latest fashions in radical chic.Drawing from ideas first presented in his U.S. News and World Report columns Leo charts the political fever of a contentious and disordered period in American society. At the same time his pointed humor, long-term perspective, and strong moral edge ensures his continuing importance to the debates of our time. This book will interest those who share Leo's concerns as well as those who appreciate models for incisive political commentary.